Curt McDermott is a birder in Orange County, New York. He has an amazing array of feeders up in his small suburban yard that attracted an amazing bird and flocks of birders this winter. As of this posting the bird is still being seen daily. Curt has been a gracious host to the birding hordes and deserves kudos for not only managing to recognize and identify such a rarity, but for putting the word out and helping make sure other birders got the chance to see the bird. So, if you are ever out in the field and see a rare bird and then run into Curt make sure you let him know, and, if you have to, walk back to where you saw the bird and point it out because he deserves all kinds of good birding karma! Thanks, Curt, for sharing the bird and your story and pictures. Ken: Hi, how are you today? Ken: Why, what do you have? Curt: I have…a need for you to see this bird, when can you be here? Ken: What do you think it is? Curt: I think…I want you to see it first because I don’t want to call this one alone. Ken: Ok, I’ll be right over. It was the morning of December 22, 2007, a day that would turn out to be a special day at our home feeders. Dad arrived quickly, seeing the mystery bird almost immediately. “So do you think it’s a Hoary?” he asked. “Well… I think it might be,” I replied with some apprehension. “I think it is!” sounded the reassuring words I had hoped for. Now it was time for photos and more field guide review. The bird made several more visits to feed that day but was not seen again for the remainder of the year. I really enjoyed giving Dad a “Life Bird” that day, several hundred species more and we will be even. New Year Day 2008 began with a call up the stairs from Sara, “Look how many birds are at the thistle feeder,” she said. With tired, New Years Day eyes, I looked out to see twenty birds at and beneath the feeder. 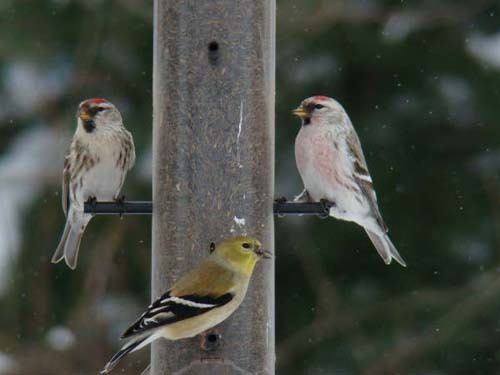 I focused my binoculars and there were my first three birds of 2008, an American Goldfinch, a Common Redpoll and a Hoary Redpoll. I’ll let you guess what order I have counted them in. In all we had nine commons and the one hoary. After showing the bird to Sara and Lacey, it was then time to call Dad again and get back to the photographing, field guides, and Sibley’s fourteen pages of notes differentiating the Hoary Redpoll from the Common Redpoll. With a bit of certainty, it was time to get the word out so others could enjoy this great rarity. I first called Tom Burke and Andy Guthrie (members of the New York State Avian Records Committee and all-around top-birders). I like and respect them both very much although there is always a very tense moment for me just before receiving their approval on any bird ID. Fortunately, Tom showed up the next day and gave the bird a thumbs up! Whew! It was then time to notify the Edgar A. Mearns Bird Club and post a notice on the state listserv. Word of the Hoary Redpoll has spread far beyond what I would have expected at the start of all this. 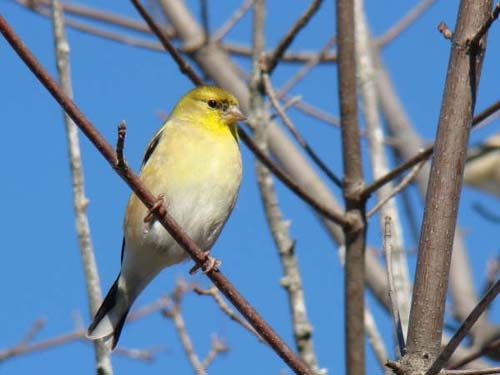 The little five-and-a-half inch wonder has attracted birders from Long Island, New Jersey, Massachusetts, Connecticut, Pennsylvania and all of the state of New York. To date, over 200 birders have visited our feeders. In hindsight, I wish I had kept a sign-in book but who would have guessed it would last this long? I still respond to several e-mails daily as well as the occasional phone call, knowing they will increase as the weekend approaches. I have had the unique opportunity to share this bird with many “Mearnsers” as well as other birders, many of whom have taken the time to show me birds in the past. It has been great fun giving back to this wonderful pastime I have come to enjoy so much. 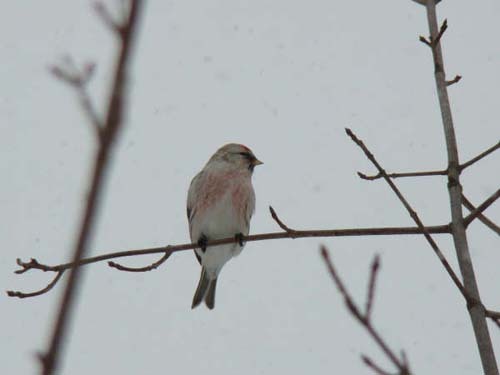 The Hoary Redpoll has been a new bird for most, even many of the area and state’s notable birders and has provided excellent looks for all. Sara and I no longer park in our designated parking spots, as birders continue to appear daily for a chance at a “Lifer” and our spots offer the best vantage point. A typical weekend morning finds ten or so birders in the parking lot before sunrise, with a constant flow continuing throughout the day. I have resorted to bribery in dealing with my neighbors. This morning I cleaned the snow off the car belonging to the woman in unit 13. I share my binoculars with the neighbors in 11 (who were unaware that there was such a large “sub-culture” of people who liked birds) and bought a feeder for the folks in 14. So far so good! The feeder count in our yard has now grown to eight, five of them being thistle feeders. I have learned a few things about economics through all of this. Supply and demand for example: goldfinches demand that you supply them with thistle. There is a direct correlation between the number of feeders you have and the number of goldfinches you will attract. Thirty goldfinches and four redpolls can eat four to five pounds of thistle a day. Oh yeah, thistle can become an expense! I will be lobbying for a name change the next time the powers that be (American Ornithologists’ Union) get together. I will propose that Common Golden Pot-bellied Piglet Finch replace American Goldfinch as they are gluttons with insatiable appetites. As is my daily ritual, I checked the feeders this morning upon getting up. The bird has become such a constant in my daily routine that it is often difficult to prepare for the day without at least a confirming glimpse or nod from Sara that she has seen the bird. When I see the bird, I am reminded of my Dad, who asks “where were you born little bird” after seeing a rare bird, or a comment made by Dennis Murphy about the nest it was born in, being lined with ptarmigan feathers. Both comments serve as a reminder that this bird is far from its normal beaten path. As I look outside today, February 13th, for the 44th day in succession, I am pleased to report that I have a Hoary Redpoll at my feeders. I hope you have all made or will make the time to see this bird, as I have a feeling it may be some time before the next one appears. Much like a pet owner with an aging animal, I have relished the days with this bird but often think of the day when I will wake up and never see it again. Peace of mind comes when I admit that the bird is not mine, I have never owned it and never will but have been fortunate to have this frosty little visitor at my home, if only for a while. Did I mention that thistle is expensive even in bulk?! And the Common Golden Pot-bellied Piglet Finches…oh, my goodness! Man, I have to get up there! Thanks so much for sharing this bird and your story, Curt. Jealous of the hoary sighting. And I LOVE the new species, the Common Golden Pot-bellied Piglet Finch. I’m so glad it wasn’t named after its discoverer – this name is so much more descriptive!! Nice post.